I love being outside and am so happy that my nieces and nephew share the feeling. I’ve taken the two oldest nieces camping and hiking in the past so decided it was time to take the next two on the trails. 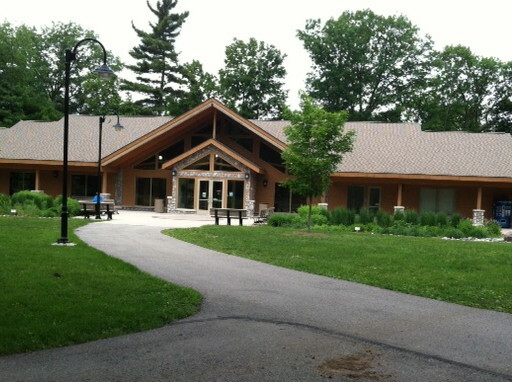 I picked Stony Creek Metropark in Shelby Township because it’s one of my favorite local parks. 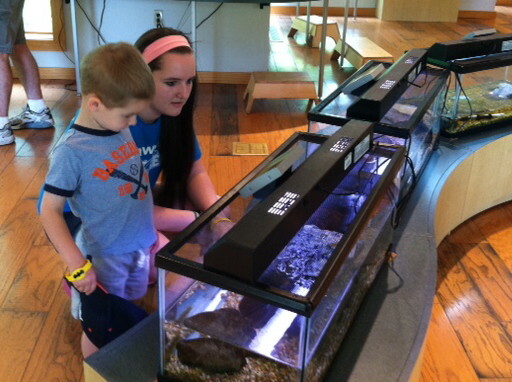 Plus there is a nature center at the park so figured if the kids got bored (gasp!) or tired on the trails, we could wander through the building. I shouldn’t have worried about being bored or tired. In fact, I was told on the drive home that we needed to go back to “spend hours in the woods” (courtesy of my 4-year old nephew). That warmed my heart. 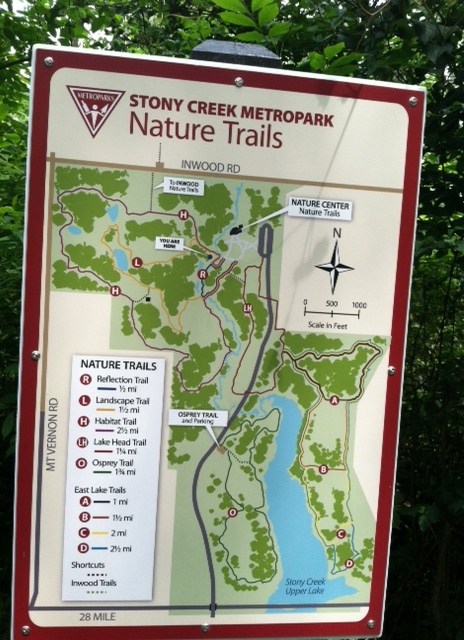 While I’ve hiked many times in Stony Creek, we usually stick to the hiking/mountain bike trails near the West Branch picnic area. Since these trails are shared with bikes, I decided we would explore the trails by the Nature Center. It would be a new experience for me too. So I headed out with three nieces (ages 6, 15, 17) and my nephew (age 4). We were supplied with snacks, water, sunscreen, wipes and a few other necessities for wandering the woods. Two of my nieces and I carried day packs. In preparation for being on the trails, I created a scavenger hunt form – look for a squirrel, acorn, flowers, etc. The kids got really into the task of looking for the items and we spotted a deer, chipmunks, lots of flowers and leaves, acorns and birds. The squirrel alluded us until we were leaving. We also talked about the concepts behind Leave No Trace and how the woods serve as home to many different animals. There are several variations in habitat on t he trails, which was fun to explore. The trail led us past the Clinton River, where we took our first break on the bench to re-apply sunscreen and open granola bars (a long 10 minutes into the hike!). There are benches at various locations along the trail, which is nice to rest and enjoy the sights. At a fork in the trails, I made the mistake of asking which way we should go, only to get two different answers! Being a nice aunt, I decided we’d do both routes so we hiked a bit on one trail, then turned around and headed to the other trail. The trails are really well-groomed and while not too difficult in elevation or terrain, a good distance for a nice workout/hike. We didn’t get to hike the entire route of any trail but it was enough of a teaser for me that I’m looking forward to going back with Justin or some adult friends who can hike a bit longer. Although the younger two kids said they could have gone on much longer! The only thing that bugged me is that there is a shooting range not far from the nature center so we heard shots constantly while on the trails. Once when we all stopped on the trail, I suggested we be quiet to listen for the sounds of nature – the sounds of shots were the most evident, which finally made us laugh because what else could we do. On our way out of the park, I showed the kids all of the other fun activity sites, including some beaches, picnic areas, paddle boat and canoe rentals and the fitness trails. H and M were excited to see all that the park offered, wanting to visit again with friends. 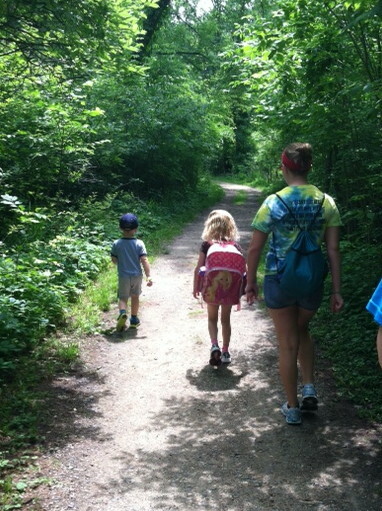 We all decided it would be a great plan to hike the nature center trails again, then have the rest of the family meet at the beach for an afternoon of fun and barbecuing. I was so happy the kids loved hiking and being outdoors as much as I do. I’m glad to share this interest with my family and look forward to hiking again with them. The kids decided our next adventure would be camping….with the entire family. The planning alone might be an adventure for that idea!